3D printing technology is evolving very quickly and its affordability helps many designers to visualize their ideas with simple tools such as with a desktop 3D printer or a 3D scanner. One of the technologies that benefits from 3D printing technology is the prosthetic or robotic devices. Previously, the cost of a prosthetic hand could range between $10,000- $100,000 based on many factors. This price was not affordable for many who lost their hands or were born with a disability. By contrast, 3D printed prosthetics are much cheaper costing less than $1000. One of the unique initiatives on this course of emergent technology is e-Nabling The Future foundation. 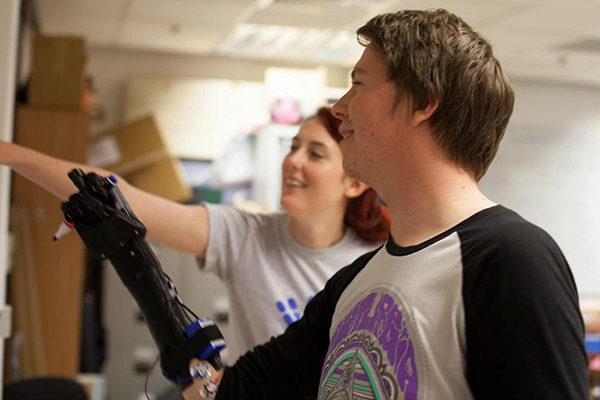 This open source group provide 3D models for prosthetics on their website, where any one from around the world can download, 3D print and assemble. In addition to the price, 3D printed prosthetics solves many problems associated with traditional devices such as a heavy weight and difficult maintenance. However, one big problem –the look and feel of 3D printed prosthetics. Currently, 3D printed prosthetics are based on a rough 3D model which produces a robotic hand that does not look real at all. As the design process should always be emergent and developing, some positive signs were made. 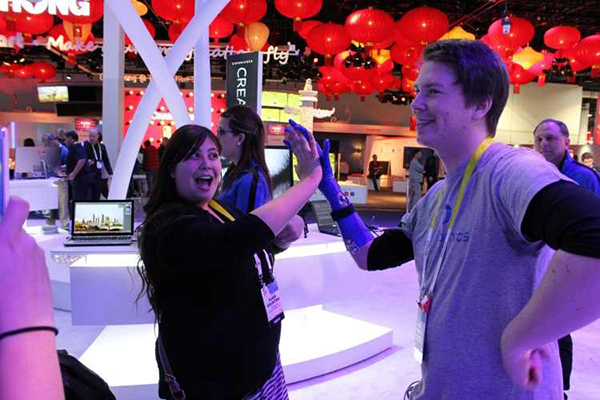 Daniel Melville, 24 years old, and who was born without his right arm showed up during the Consumer Electronics Show in Las Vegas with a new prosthetic design and the visitor’s reaction was very positive. The new design was created by Joel Gibbered, a 24 year old engineer and the founder of Open Bionics. The company aims to improve the design of 3D printed prosthetics look and feel to solve the current and biggest problem that faces this new product. The new 3D printed prosthetic is half the weight of the traditional devices and is expected to be sold for less than $1000. The 3D printed prosthetic works that same way as other 3D printed arms by using the movement of the muscles located in the limb. The muscle’s movement is picked up by an electromyographical sensors on the skin. The design of the prosthetic starts with 3D scanning the missing limb and rendering it into a 3D model. Then, the 3D prosthetic model is modified to fit the limb measurements. Finally, the model is printed after which –testing and physical therapy is applied to let the patient get used to the new hand. As described by Gibbard, the next step is to replace the wires of the sensors and the inner parts to work wirelessly. This will help reduce the weight of the current design. Additionally, the adjustment of the prosthetic or replacing any consequential damage parts would be much easier. Gibbard is not the first to try thinking in building a prosthetic that interacts smartly with the patient. Previously, we introduced LaChappelle’s initiation. His research aims to build a full arm that can be controlled with the brain nerves. The One Bionics is an example of how 3D printing technology is emerging and how it is developed based on individual initiatives. This makes it very promising and rapidly improves technology. While organizations such as the e-Nabling the Future works to develop 3D printed prosthetics based on working groups, models such as Gibbrad’s hand provide further improvement. However, each of these initiations work separately, however we may see a time when the two collaborate together in order to reach a final product that meets with the patient expectations.